Here is the chart for the First Moon Landing by Apollo 11 commandeered by Neil Armstrong, co-piloted by Buzz Aldrin, and presumably photographed from an orbit above by Michael Collins. 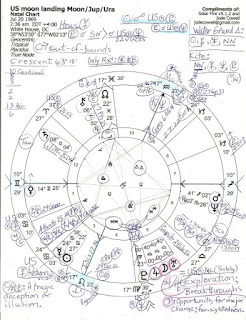 The chart is set for the White House, DC, primarily because of the political nature of the landing - or pseudo-landing, as some still insist - with the Moon's position in the zodiac used as a timer - Moon, Jupiter, and Uranus conjoined at 00Lib40 at 2:36 am edt, Washington, DC. The Great Conjunctions of Jupiter and Uranus mark the start of new cycles of breakthroughs including scientific ones, adventurous explorations, inventions, and lucky opportunities. Inventions have certainly come out of NASA's space program. You'll find this interesting planetary combination masterfully covered in Anne Whitaker's book, Jupiter Meets Uranus which I like so well I've reviewed the book on Amazon and highly recommend it to you. ...see lower left corner for a partial listing of its meanings, but here's all of it...the apex planet is secretive yet wealthy Pluto, with his ultimate coping abilities, but Pluto is conjunct US natal Neptune, a time when power can become an illusion or can be slowly eroded and undermined; there are political, economic, and physical power struggles with Pluto having the upper hand; the Soviet Union had bested the US by launching Sputnik I on Oct 4, 1957, the actual beginning of the Space Age...so the US government had many reasons to fake this Moon Landing if it seemed politically necessary. It did. Sun/Neptune = tr Pluto: use of the spiritual, psychic, or illusory as a force for persuasion; a fateful deception or illusion; extremely high sensitivity. One chart factor isn't enough to toss out the baby, I agree, but this major midpoint picture is included to illustrate a main theme of July 20, 1969. 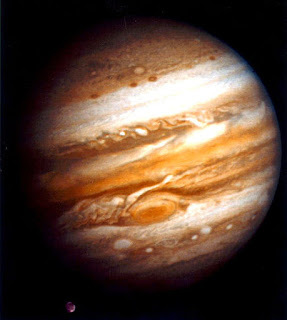 Moon/Jupiter = n Mc: social-minded or religious person; confidence; popularity; the joy of expectation. Moon/Jup = tr Uranus: love of enterprise; confidence; hilarity; sudden good fortune. Moon/Uranus = n Mc: great energy and excitement; the pursuit of ambitious aims; ready for action; tending to interfere suddenly. Moon/Uranus = tr Jupiter: aims on a grand scale; a lucky hand in enterprises; satisfied ambitions. 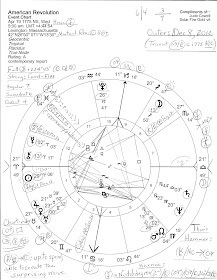 Hopefully a simple click will enlarge the chart image for you and my chicken-scratch notations will appear with more details, such a Water Grand Trine between Sun, Mercury, Neptune, and NN. A Kite pattern was formed between NN (the Kite's tail, which puts Pluto/SN/US natal Neptune as the lead directors), Mercury (the evening of July 19 was an annual US Mercury Return; Hour of Mercury), Neptune, and Pluto. 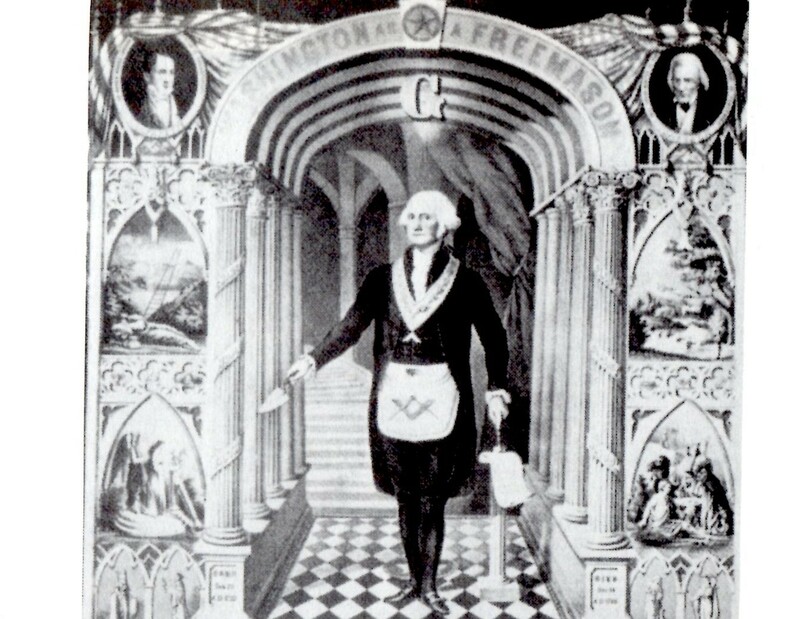 Neptune and Pluto together are the signature of the industrial Robber Barons (1890s) who were hoping that metals, gems, and/or water would be discovered on the Moon. With NASA's and Washington's newly stirred interest in going back, perhaps they're hoping still. Well, this Kite was definitely flyin' high, wasn't it? But did it really land on the surface of the Moon? What do you think? Wikipedia has more info on Moon landings than you can shake a film producer's wand at, if you're interested.